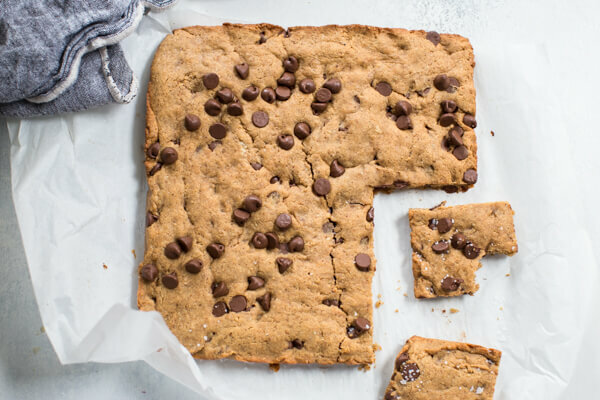 Almond Butter Blondies that are actually healthy-ish! I mean we still have some butter and sugar because blondies. Gluten free and keto-friendly. 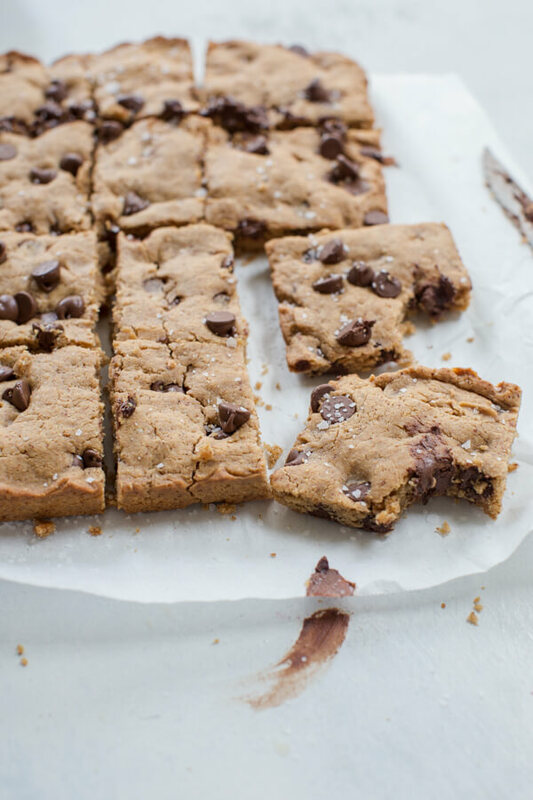 This the BEST chocolate chip cookie bar recipe! 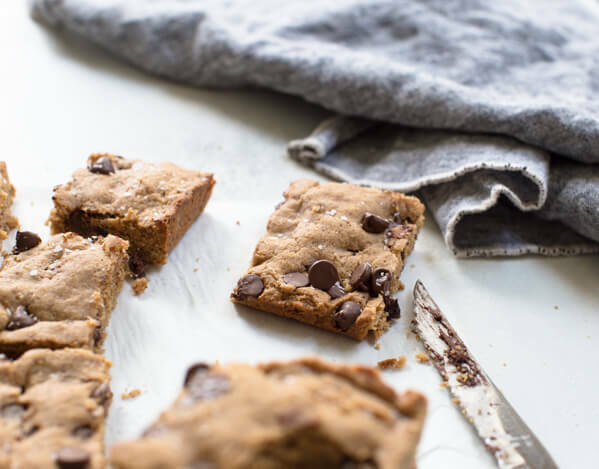 Almond Butter Blondies make the BEST chocolate chip cookie bar recipe that’s gluten free and keto friendly! Helloooooo healthy-ish dessert heaven! 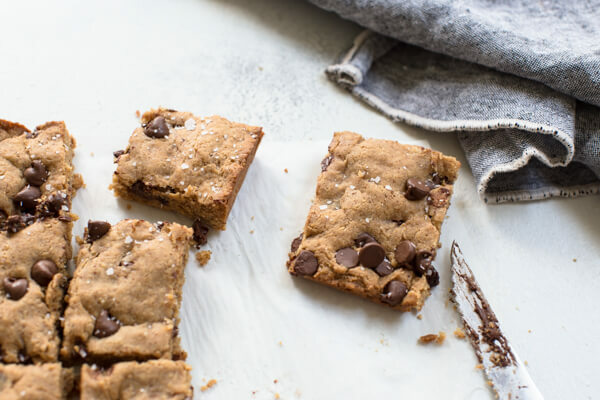 These cookie bars are a recreation of an almond butter blondie recipe I posted during the early days of the L&Z blog. Of course the earlier recipe was higher sugar and made with refined flour. 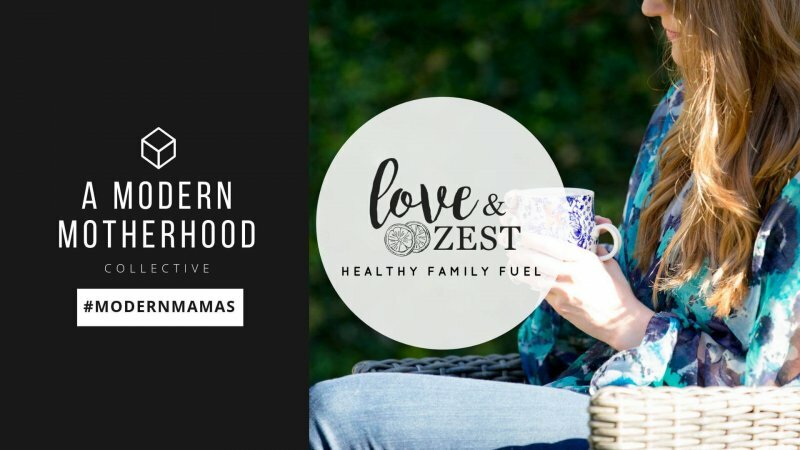 An oldie but goodie recipe that I just couldn’t resist recreating for you guys, to make it a little on the healthier side but still oh so good. 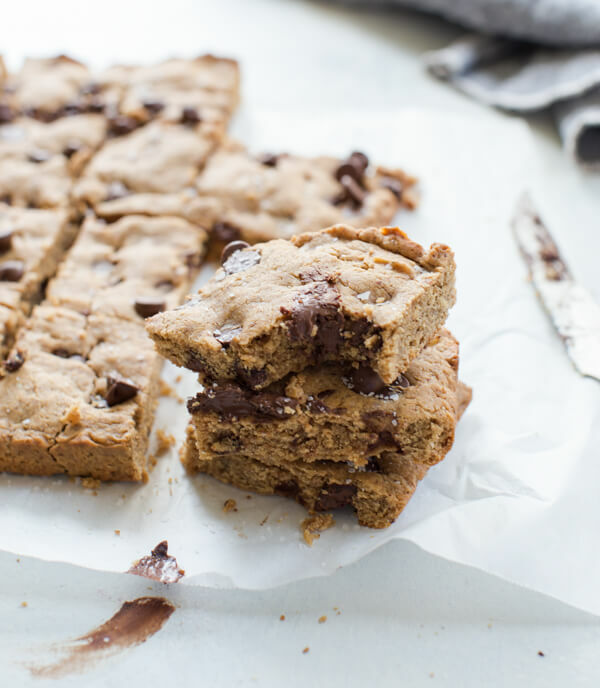 One thing remains though… these almond butter blondies are still heaven on earth. Chocolate lovers rejoice! 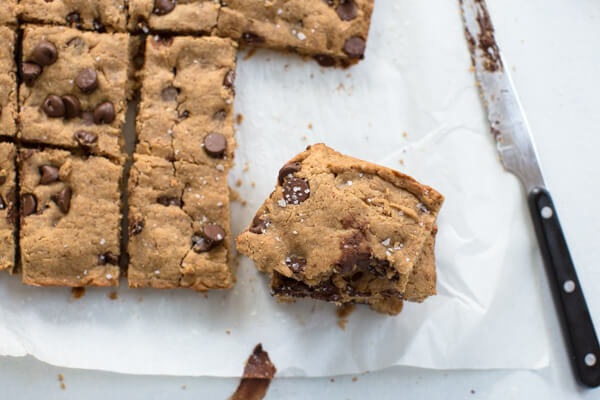 These blondies are full of chocolatey goodness and the almond butter makes them sooooo creamy and just downright dreamy. The simplicity of this recipe is almost too good to be true. Combine these ingredients together in one mixing bowl. That’s it! Yep, this recipe uses ONE bowl. Just make sure to really stir the eggs into the sugars and butter until it creates a “glossy” look. This is the key to the “crinkles” on top. What’s the difference between a brownie and a blondie? Although they taste somewhat similar, there is one main ingredient that differs between a brownie and a blondie – cocoa powder! Cocoa powder is what gives brownies their darker color and the same reason that blondies are lighter in color. How do you store blondies? 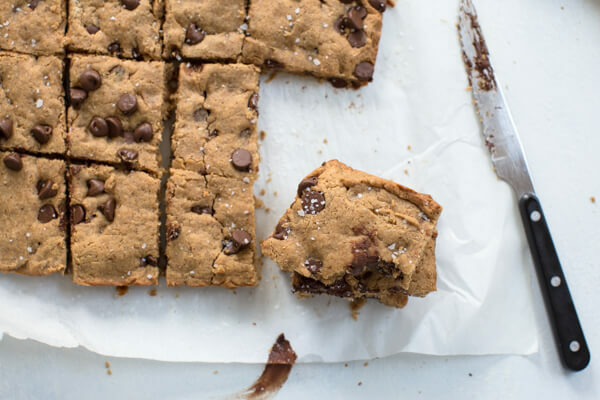 There are a few options when it comes to storing these delicious almond butter blondies! First, they can be stored in an airtight container at room temperature for up to 3 days. 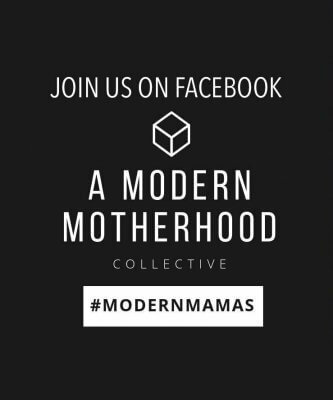 Personally, I keep mine stored in glass storage containers in the fridge for up to 1 week! Wanna know a secret??? When you’re ready to dive into an almond butter blondie, these bad boys are even better room temperature. I don’t know why but possibly it’s because they are made with almond butter and when the almond butter is at room temp the texture is more resemblance of a brownie. But if you prefer melted chocolate blondies, microwave it for 10 seconds to get the chocolate all melty and ooey gooey. 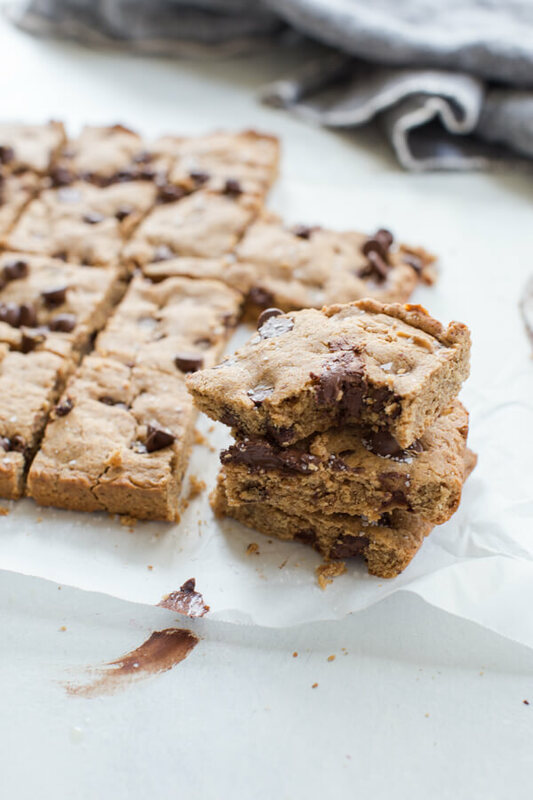 What other way is there to enjoy one of these chocolate chip blondies?! Oh, these blondies can also be stored in the freezer for a couple months. Simply thaw, reheat and enjoy! What are blondies made of? Think of your favorite chocolate chip cookie recipe as a cookie cake but thicker, ooier and gooier. 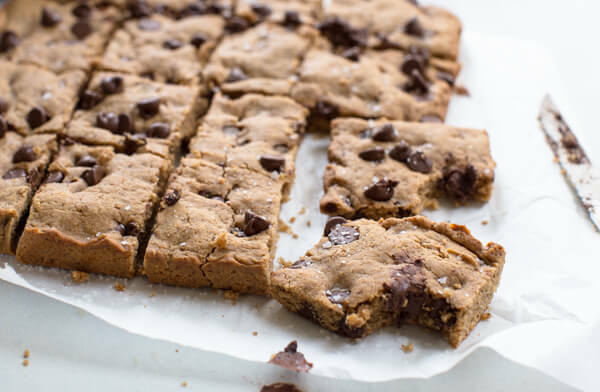 Blondies consist of the same ingredients as a typical chocolate chip cookie recipe – flour, sugar, baking powder, eggs, vanilla, chocolate chips, etc. 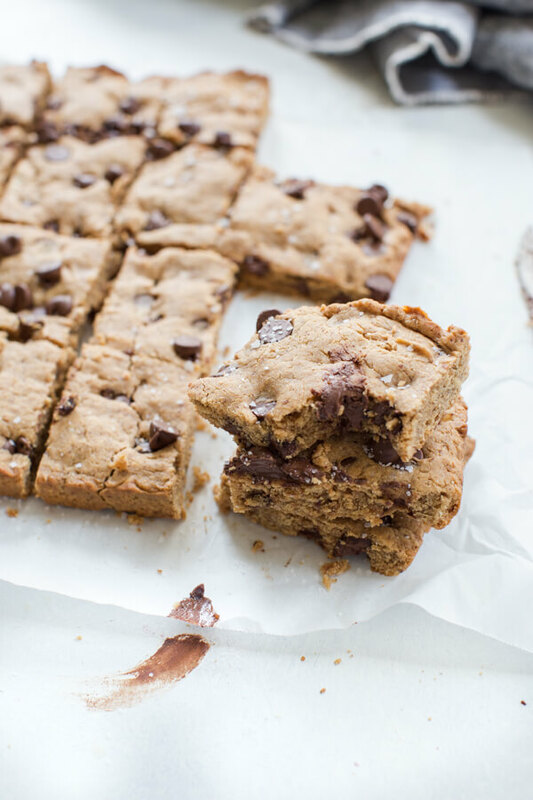 But this blondie recipe is a healthified version with almond butter and almond flour! And trust me when I say they’re the real deal! Oh yes… they all sound divine. Yep! Almond butter contains healthy monounsaturated fats from almonds. 1 tablespoon of almond butter contains about 95 calories and 3.5 grams of protein. So it’s pretty comparable nutritionally to peanut butter. 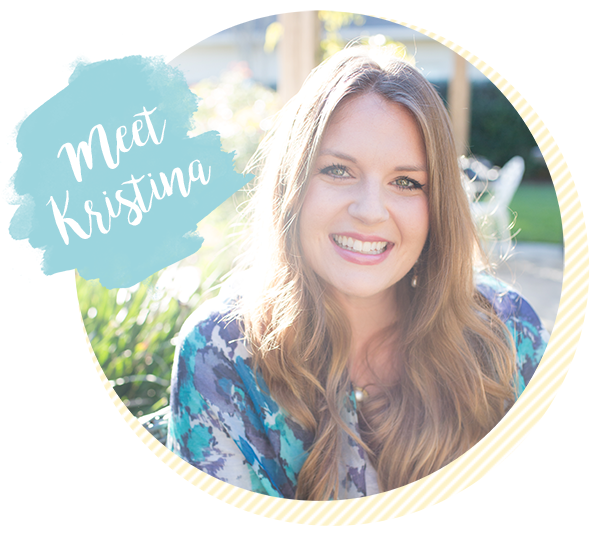 It’s important to note that some almond butters contain added sugars and extra oils. While minimal, if you want the cleanest label be sure to check the ingredient list for only almonds and salt (there are unsalted brand options available as well). If you’re purchasing an almond butter with almonds and salt as the only ingredients, you can bet your bottom dollar that it’s healthy! Recreating this blondie recipe from the early days of L&Z might have been my best decision ever! What’s not to love?? 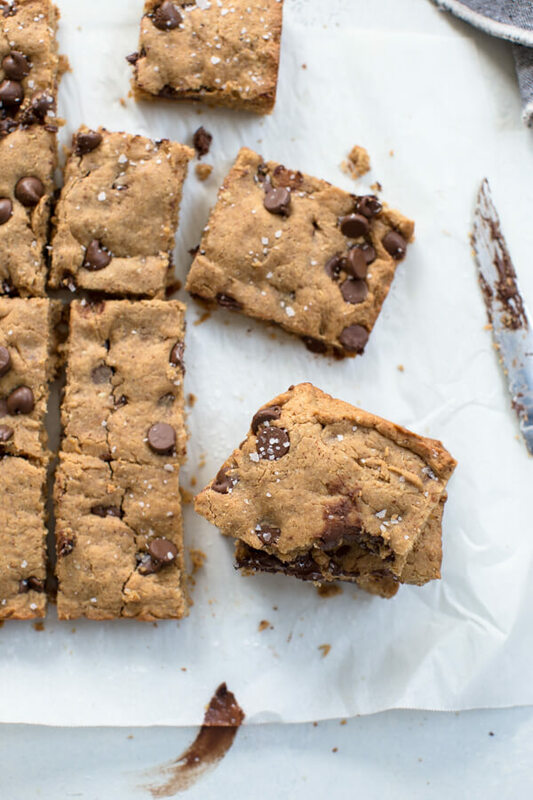 Try these Almond Butter Blondies for yourself and you’ll see what all the hype is about! Preheat oven to 350 degrees F. Prepare 8×8 in square pan with cooking spray; line with parchment paper if desired for easier removal from pan. In a large bowl, mix together butter and almond butter. Stir in sugar until fully mixed. Add eggs and vanilla and stir until mixture is shiny. Add baking powder, salt and almond flour and stir just until combined. Fold in half of the chocolate chips. Pour batter into pan and spread, top with remaining chocolate chips; bake 20-25 minutes. 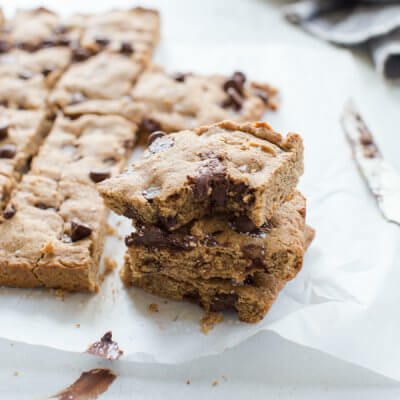 These blondies look so good, I love that you used almond butter, my favorite nut butter, can’t wait to make these, my whole family will devour them! I loe almond butter in desserts. It adds such a lovely fudgey texture. These blondies look so delicious. Chocolate and almond butter together sounds wonderful. Great for someone with a sweet tooth like me. These look fabulous!! It’s always important to start your day with a healthy breakfast so I may have to try these for breakfast! I wouldn't call these “healthy.” But they are definitely delicious! My daughter, who tends to be fussy, declared after the first one that she wants us to bake these for her birthday at school instead of cupcakes. We substituted cashew butter for the almond butter because it's what we had on hand. Cashew butter has a very neutral taste, so they were decadent and the chocolate popped. Those look so good. Im going to have to try to make them! Hey Rachel! Thanks– I just wanted to let you know that I’ve updated the recipe. 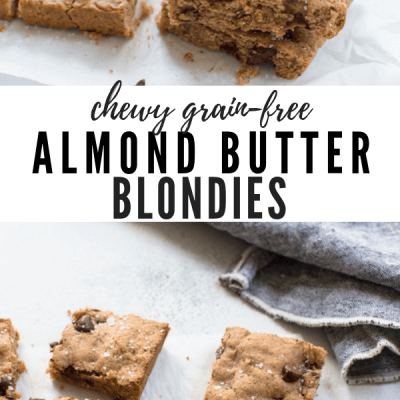 If you tried the original and loved them I’d love to see what you think about this “healthier” blondie recipe. Thanks Matt 🙂 I just gave them a facelift so they would make a yummy snack.